Click HERE to watch a live update on overnight icy conditions. 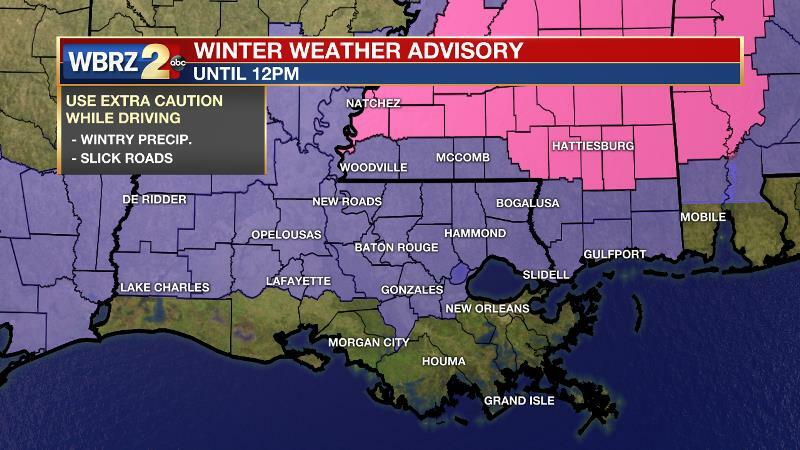 A *WINTER WEATHER ADVISORY* is in effect until 12pm Friday for East Baton Rouge, West Baton Rouge, Ascension, Assumption, Iberville, Livingston, Pointe Coupee, West Feliciana, East Feliciana, St. Helena and Tangipahoa Parishes as well as Wilkinson, Amite and Pike Counties. A winter weather advisory means wintry precipitation could cause travel difficulties. *Snow and sleet will continue through midday Friday. *Accumulations will be light, mainly on grassy surfaces. Generally, a coating to two inches is expected. Don't focus on possible amounts, such maps and forecasts vary too often and create confusion. Just be aware of possible impacts. *Temperatures are expected to hover around 32 degrees, so widespread icy roads are not anticipated. The only exceptions may be elevated surfaces such as bridges. *As snow falls, visibility and traction will be reduced while driving. Stay off the roads if possible. *If you hear a rumble or see a flash, that is indeed "thundersnow" which can occur in particularly intense bands of precipitation. Today and Tonight: Snow, sleet and rain will continue through about midday across southeast Louisiana and southwest Mississippi. Precipitation will end first in areas north and west of Baton Rouge around 9-10am and end last in areas south and east around noon. All told, a coating to two inches of snow will accumulate. Thanks to cloud cover and the wintry mix, temperatures will likely fail to reach 40 degrees. North winds of 10-15mph will create wind chills, or feels like temperatures in the upper 20s and low 30s. 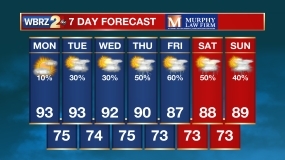 Overnight, skies are expected to clear out quickly. As this occurs, temperatures will drop off into the upper 20s, marking the first freeze of this cool season for many areas around Baton Rouge. Where moisture remains on the ground, some icy surfaces are possible, so use caution if venturing out on the roads. 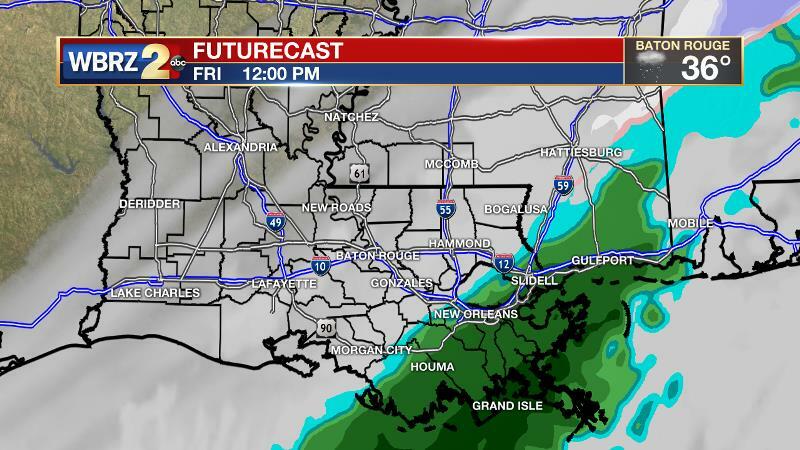 Should you see any wintry precipitation, send photos to weather@wbrz.com or tweet them to @WBRZweather! Be sure to include your location and the time of the photo! Up Next: The weekend will be generally clear with highs in the mid 50s and lows near freezing. Slightly warmer afternoons are ahead for next week as a drier pattern takes hold through at least Thursday.